Swoopy Salvo is the thirty-ninth level in Donkey Kong Country 3: Dixie Kong's Double Trouble! It is also the fourth area of Krematoa. In the Game Boy Advance remake of the game, Swoopy Salvo is instead the forty-fifth level. The tall trees of this level are home to Swoopies. Flocks flying through the trees from one hole to another can cause harm to the Kongs with their sharp bills. Squawks the Parrot is also playable for the first half of this level, flying upwards through the trees, while he avoids the Swoopys' barrier. Since the No Squawks sign will turn Squawks into a Steel Keg, the Kongs will only have one chance to defeat Koin. Other enemies here include Bristles, Buzzes and a single Booty Bird. At the beginning of the level, the Kongs will find a branch stretching outside of the first tree. While on the branch, a Swoopy will shoot out from above them and serve as a plat form to reach a higher branch. Climbing up the area, the apes will find an Animal Barrel. Jumping in, they will turn into Squawks, who will need to defeat the green Buzz blocking his path. After entering the second tree, the bird will fly upwards and dodge a long red Buzz before exiting the tree. Outside of its trunk, he will find a straight pathway leading back into the first tree. While flying upwards in this tree, he will avoid several Swoopies, flying in and out of the tree. Soon, the parrot will spot a small hole to exit the tree with. If he chooses to travel farther, he will grab the letter K and head into the second tree again. Heading north in the tree will take past a few red Buzz, and later to the tree's exit. He should get out of the tree and cross into the neighboring tree. In this part of the tree, the bird will simply fly upwards to a small hole. Going through it, Squawks will find himself in a large, open area. Many Swoopies will dive from tree to tree here, so he will have to dodge each one, until he makes his way to another one of the first tree's entrances. Once he safely manages to get in the tree, Squawks will find a hole above him leading outside of the tree. There, he will find another passage into a different tree, blocked by a Buzz. After he defeats the Buzz and gets back into the second tree, the parrot will fly farther upwards a avoid one group of Swoopies until he reaches an opening. It will lead him onto a strong branch outside, where he will pass the No Squawks sign. It will turn him back into the Kongs, who will then need to jump into the above Auto Fire Barrel. The barrel will blast them near a passage leading into the second tree. The heroes should get in the tree to find the Star Barrel, as well as a rope. About halfway into the level, the heroes will climb up the rope and avoid many Swoopies, diving at them in a diagonal pathway. Once the apes make it to the top of the area, they will find their way outside of the tree onto a set of branches. They should climb up the branches and walk through the opening on the highest branch, watching out for some Swoopies. Soon, they will find a Blast Barrel in the air, which can only be entered by bouncing on a nearby Swoopy. The barrel will shoot them to some higher platforms, which the apes should climb up to find some more Swoopies. The birds will smash their bills into the wall, turning into a platform for the Kongs. If they monkeys climb up, they will make their way to a small opening. Going through it, the apes will walk across a large branch, traveling into the second tree again. There, they will find a rope to climb. As they clamber up the vertical tightrope, they will pass more Swoopies and find the letter N. At the top of the area, they will find another doorway leading out of the tree. Dodging the Swoopies diving through the doorway, Dixie Kong and Kiddy Kong will climb onto a branch to meet more Swoopies to use as platforms. They should hop upwards on the five birds and reach a high platform inside of the first tree, where they will jump up several smaller platforms in the trunk to reach the doorway out of the tree. On the end of the short branch that it leads to, the apes should make a big jump to reach the entryway into another area of the second tree. Inside, they will climb up some more wooden platforms and sneak through a small hole to find the outside of the two trees. There, they will need to bounce on some more Swoopies diving out of a small hole to reach a high area inside of the neighboring tree. Traveling through the tree, they will pass a Bristles and find the letter G. If they cross between the level's two trees by using a large branch, they will see a flagpole. Raising its flag will end the level. Right after the letter K, Squawks the Parrot will enter the second tree. If he decides to head south in the tree, he will find a Bonus Barrel. It will take him into a Bonus Level, where he will pass a No Squawks sign to turn into the Kongs, who will need to use Swoopys as platforms to reach a high branch. On this branch, they will find a Bonus Coin. Right before the No Squawks Sign, above a Banana Bunch, Squawks should fly north through the outside of the two trees to find a small opening. If he manages to avoid the Swoopies flying through it, he will enter another tree with two Buzzes flying around a lone banana. The parrot should fly to this banana to end up in a hidden Bonus Barrel. The barrel will take him into a Bonus Level, where he will need to collect fifteen green bananas while avoiding two groups of Swoopies. Once enough bananas are collected, a Bonus Coin will appear nearby. 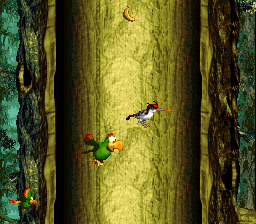 After shooting through the level's first and only Blast Barrel, the monkeys will need to climb up to the top of the tree trunk and then exit it through a small opening. Outside of the tree, they will notice some Swoopies diving across the area. If they bounce on the Swoopies and get high in the air, they will find a Bonus Barrel to the left of a large branch. The barrel will take them to a Bonus Level, where they will have to use their Team-up move to grab stars high in the air. A DK Barrel can be found nearby to return a lost monkey. Once all the stars are collected, a Bonus Coin will appear to the right. After leaving the second Bonus Level, Squawks will end up near the Koin, who will have the DK Coin. If he passes the nearby No Animal Sign, he will turn back into the Kongs, who will need to defeat the Koin. The enemy's shield will protect him from most attacks, so getting the DK Coin will not be too easy. Using the Steel Barrel given after passing the No Squawks sign, the monkeys will need to stand on the foe and then throw the barrel at the nearest wall. With the Kongs on top of his shield, the Koin will keep his attention on the heroes, not noticing the barrel bouncing off of the wall. The Steel Keg will then hit into the distracted Kremling. This will defeat him, thus giving Dixie and her young partner the DK Coin. This page was last edited on April 10, 2019, at 13:54.